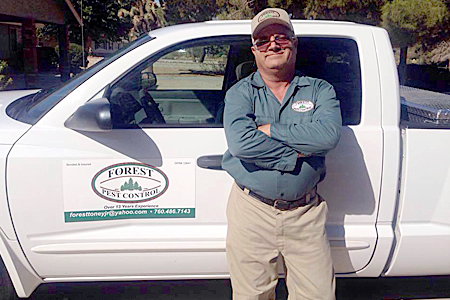 We, at Forest Pest Control, have professional exterminators that offer complete pest control services to homeowners and business owners throughout Apple Valley, Hesperia, and Victorville, CA and surrounding High Desert areas. We pride ourselves on affordable prices, fast friendly and quality service controlling ants, spiders, roaches and other unwanted pests. Not every pest infestation is the same, but with more than 18 years of experience, our company can develop a solution using the safest and highest quality products to rid yourself of these unwanted pests. The service begins with a complete de-webbing and inspection of the exterior of the home/business. We then treat the exterior with a liquid application concentrating on cracks & crevices and other areas where the pests nest. We then treat the interior using a liquid application, granules, or gel baits depending on the situation. We offer a one-time service which is covered by a 30-day guarantee, or regular monthly, bi-monthly, or quarterly services which are guaranteed for as long as you receive service.